La questione del divorzio nell'Italia del secondo dopoguerra mette in luce una società nella quale le istituzioni venivano strattonate in direzioni opposte: discorsi religiosi, politici e culturali cercavano di rinforzare le concezioni tradizionaliste, mentre lo sviluppo economico e sociale produceva effetti destabilizzanti. Esaminando la questione del divorzio nelle pagine di Noi donne (una popolare rivista femminile di sinistra), l'colo sostiene che le pubblicazioni su matrimonio, famiglia e divorzio, apparse dal 1950, contribuirono a scardinare il monopolio discorsivo della Chiesa, prefigurando e gettando le basi per la più familiare e liberazionista campagna femminista lanciata a pre dalla metà degli anni Settanta. In November 1945 the liberal Catholic historian Arturo Carlo Jemolo described the institution of the family in Italy as a ‘steel capsule’ that stood out among the fragile structures of Italian society, stubbornly resistant to the corrosive forces that had exerted their effects on families in other western societies from the late nineteenth century onwards. For Italian conservatives and the Catholic Church hierarchy, the apparent resilience of the nation’s family structures offered a proud foundation for the rebuilding of postwar Italy, and one that warranted defense by all possible means. A favoured form of protection was the discursive construction of the monogamous, indissoluble family as somehow beyond the reach of history – a natural social cell, antecedent to society itself, unsusceptible to the ravages of time, and therefore eternally immutable. This philosophy came to be enshrined in the new republican constitution, which recognized the family as a ‘natural society’ – a rhetorical strategy that gave it a special ethical status in the new Italy. The particular constellation of Italian political forces in the mid 1940s, including a communist party bent on the strategic avoidance of divisive moral issues, helped to ensure the success of this project to defend the family as a foundation of the new republic. For at least two further decades, Italy’s political, religious, and cultural contexts remained unpropitious for the introduction of laws that would treat marriage and the family as secular institutions linked to sociological developments. Even as Italy participated in the postwar economic boom and its social structures were buffeted by migration, changing patterns of work, and new demands on women, laws regulating marriage and the family remained firmly anchored in a more static, religiously determined worldview that stressed the benefits of family stability as a counterweight to social change. So strong was this Catholic discursive monopoly that the various attempts on behalf of Italian men and women to introduce alternatives have until recently left little impression upon the historiography of the nation. Yet, when the ‘steel capsule’ of the Italian family was symbolically prized open by the introduction of a divorce law in 1970, and even more so when that law was affirmed by the Italian people in a referendum four years later, the nation had passed clear turning points. Yet there can be little doubt that the lengthy discussions about divorce among Italian women from as early as the 1950s played a crucial role in paving the way for the family law changes of 1975 and the abortion debates of the late 1970s. At the time of the referendum on divorce, women voters outnumbered men by some 1.7 million, and the pro-divorce lobby feared that women might vote to abolish the divorce law. When that did not happen, the anti-divorce lobby learned to their shock that Italian women’s views about marriage and the family had changed dramatically over the previous decades, and that women could no longer be counted on to block secular initiatives. Although the events of 1968-69 have rightly been seen as a key moment in this transition, the historical focus on these years has tended to eclipse the less obvious but nevertheless significant changes of the period up to the mid 1960s. This study focuses on the gradual revolution in Italian women’s mentalities that lay behind their majority support for divorce in the referendum. It elaborates a specific instance of the argument made by David Forgacs and Stephen Gundle about the way mass culture and the media act as agents of change, providing «channels through which a more modern society was fashioned’. The article argues that a widely-read women’s magazine, «Noi donne», stands out, particularly among publications for women, for its pioneering role in fashioning such a shift. Well before the divorce question finally started to develop ineluctable momentum in parliament from 1965 (after various attempts from as early as 1878), «Noi donne» acted as a cultural matrix whose editorial policy reshaped its readers’ attitudes to questions surrounding marriage, the family, and divorce in Italy. It did so by consistently exposing the ‘steel capsule’ of the family to alternative discursive forces, assiduously presenting new ideas to large numbers of women, long before they became the subject of widespread media discussion. As a result, «Noi donne» made a singular contribution to breaking the Catholic Church’s discursive monopoly on the family at a grass-roots level, and it laid hitherto unacknowledged foundations for the advances made by Italian women in the wake of the divorce referendum. In Italy the end of World War II signalled not only the arrival of a desperately anticipated peace, but the opportunity to reconstruct democracy and society after twenty years of fascist rule. In the wake of war Italian women received the vote, (which they used for the first time in June 1946), and they looked forward to full participation in determining the shape of postwar Italy. The principal association of women on the left was the Unione donne italiane (UDI), which had been founded in September 1944, and «Noi donne» was UDI’s periodical magazine. Some of the aspirations of the day were poignantly expressed by the cover of «Noi donne»’s first postwar issue. «Noi donne», 15 May 1945, front cover. In one of two juxtaposed images, a woman of the Resistance, whose posture expresses obdurate determination, grasps a rifle. The other shows a woman sitting amongst rubble, nursing a baby in the crook of her arm, in a pose reminiscent of the Virgin Mary. Her face is downcast, expressing perhaps the tragedy of losing loved ones, or apprehension at the immensity of the task of reconstruction that lay ahead. The images are brought together by a stark caption: «Lasciato il fucile, ricostruiremo le nostre famiglie’ («Having left our rifles, we will reconstruct our families’). A more detailed commentary announces that the women of Italy, having shared in the struggles of the northern Resistance, will also share the honour of victory. The verbal sentiments are bold, but as a whole the cover projects the fundamental ambiguity at the heart of women’s official role in the reconstruction of a postwar, post-fascist, democratic Italy. Would women’s sharing in the Resistance’s military struggles open the chance to turn away from traditional gender hierarchies, and with it the possibility that families might be reconstructed according to models that would give women more freedom? Or would the reconstruction of Italy’s families draw its main inspiration from cultural roots that forever linked women to ideals embodied by the Virgin Mary? The ambiguous chimera of new possibilities for women after the war soon slipped into the past, as the optimism created by constitutional equality of citizenship with men was counterbalanced by the lack of concomitant reforms in the civil law. As a result, married women continued to be subject to their husbands’ authority, adultery remained a crime differentiated according to gender, promotion of birth control continued to be a criminal offense, and the possibility of introducing a divorce law was buried with the rubble of war. In short, particularly within marriage and the family, traditional concepts of the gender order tended to re-establish themselves after the disruption of war. The quiescence of the Partito comunista italiano (PCI), determined by the desire of its leader, Palmiro Togliatti, to avoid a religious war in the new Italy, has taken much of the historical blame for the apparent ease with which a Catholic conception of the family consolidated its postwar hegemony. The contradictory attitudes of the PCI in relation to moral questions and civil rights have been well explored, most notably by Sandro Bellassai. Less familiar, although recently the subject of rising interest, are the activities of the Unione donne italiane (UDI), sometimes seen as a collateral organization of the PCI, though it involved women from other leftist parties as well. Often assumed to have been very much subaltern to the male-dominated leadership of the PCI, in fact a close reading of «Noi donne» from the mid-1950s onwards shows that UDI trod a consistently independent path, especially in its view that the institution of the family in Italy was ripe for reconstruction from the ground up. This position is particularly evident in UDI’s support for a divorce law, a stance with which the official position of the PCI only fully aligned itself as late as 1969, by which time the introduction of a divorce law in Italy, driven by a socialist deputy, was almost inevitable. 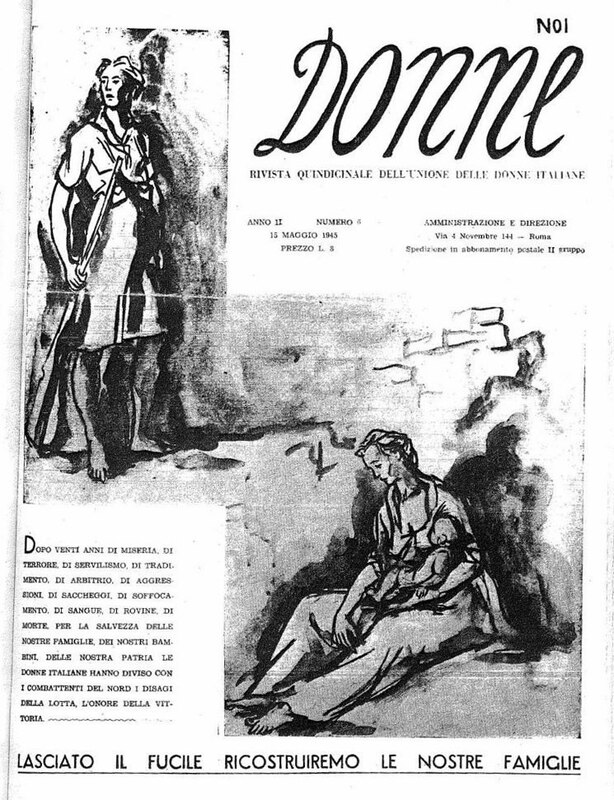 First published regularly after the liberation of Rome in 1944, «Noi donne» originally expressed UDI’s ideal of harnessing the energies of all Italian women to the cause of anti-fascism. The aim of uniting all Italian women later fell victim to the cleavage between the communist and Catholic folds in Italian society, a division that was only exacerbated with the onset of the Cold War. Nevertheless, from the outset «Noi donne»’s pages express a fundamental commitment to the reconstruction and reshaping of Italian society, and its focus on women as women helped it to transcend the political and religious fractures in Italian society. It successfully appealed to large numbers of readers, with circulation figures at 550,000 by 1954. Various features, such as its distribution by door-to-door volunteers in the early stages and of course its political auspices, made it unique among Italian women’s magazines. A reflection of its editorial mission is that «Noi donne»’s theoretical anchor in Marxism was never allowed to make the magazine sternly tendentious to the exclusion of entertainment value: features about homemaking, fashion, and beauty were comfortably interspersed with more probing inquiries into the sociological realities of postwar Italy. In January 1954 for example, an article looked at the hard work that lay behind being crowned ‘Miss Italy’, while three weeks later, the magazine investigated maternity among sharecroppers in Tuscany and presented a feature on the lives of female circus acrobats. From the outset, «Noi donne» established a winning formula, rendering social change intelligible at the individual level and entertaining readers as it did so. It made a significant contribution to an expansion of the magazine format that was to give Italy the lead in Europe in terms of publication figures. Maria Casalini has argued persuasively that «Noi donne» played a key role in familiarising Italian women with the political landscape of democratic Italy. She refers to an emblematic recollection by one reader from the 1940s, who said «Noi donne» was our university, it was the mother who took us by the hand to teach us things’. The sensible, maternal, instructive qualities that radiate from the pages of «Noi donne» even to today’s historian, add credence to Casalini’s claim about its influence on the ordinary women of Italy in the early years of the republic. One of the things that «Noi donne» sought to teach Italian women of the postwar period was that pretending the institution of the family was immune to the shaping forces of history would do more harm than good. It did this by regular publication of articles examining the relationship between women, family, and the social change that came to Italy with particular suddenness in the postwar period. 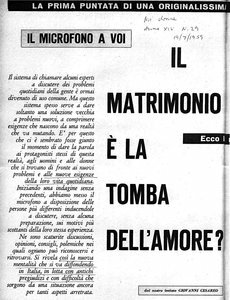 Given the conservative climate of Italy’s delicately balanced democratic forces and the wider context of the Cold War, «Noi donne» initiated such discussions discreetly, with articles titled, in January 1949, for example, Che cosa pensate del matrimonio? (‘What do you think of marriage?’). The mere posing of a question about marriage to the female reading public in 1949 may not appear, sixty years later, to have been in any way radical. But by inviting the public to submit their opinions on a subject that was supposed to be immutable, «Noi donne» delicately opened possibilities for discussion about a subject over which Catholic doctrine exercised enormous influence. A clear result of that influence was an effective taboo against the discussion of divorce in postwar Italy. Yet, a few months after the article on marriage, «Noi donne» approached divorce directly, although at a certain remove, with an article about the phenomenon in the United States. While gently suggesting that Americans’ «rather too easy» resort to divorce emptied the facility of its «moralizing essence», the author thought opposition to a divorce law in itself was ridiculous. As Bellassai points out, in an historical context where it was rare to find the slightest mention of anything morally unorthodox in the mass press, the assertion that divorce had a «moralizing essence», that is, the potential to be morally beneficial, was in itself noteworthy. More consistently than the occasional discussion of such issues in the daily press or in highbrow journals with limited readership, «Noi donne» began to throw grains of sand at the public image of the family as a steel capsule: those grains may have left no trace initially, but with time, they catalyzed a healthy corrosive and ultimately transformative process. 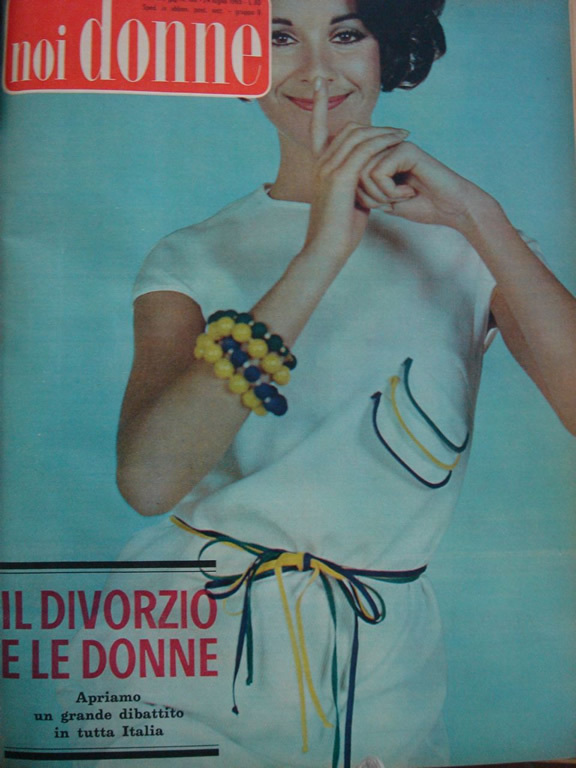 «Noi donne»’s notion of the potential moral benefits of a divorce law was at odds with the cultural context of Italy in 1949, and in the landscape of women’s magazines its position on the family continued to stand out until the 1970s. But in 1954 the question of divorce returned to parliament for the first time since the writing of the constitution, when the socialist deputy Luigi Sansone presented a proposal to introduce a divorce law to the Chamber of Deputies. The proposal was not taken up, and he made another attempt in June 1958, this time to the Senate, in partnership with fellow socialist Giuliana Nenni. This proposal also failed to gain traction, underlining the difficulty of inserting a discourse of family mutability into the hegemonic insistence on family stability in 1950s Italy. Yet Sansone’s efforts were not without resonance in wider Italian society. His lasting legacy was the concept of the ‘fuorilegge del matrimonio’ (‘matrimonial outlaw’), widely disseminated by a book of the same title, published in 1956. It was based on a selection of letters from members of the Italian public who had written to the deputy about their marital situations. As «Noi donne» had done a few years earlier, Sansone’s book argued for recognition of the potential moral benefits of a divorce law by publicizing a variety of cases where the vagaries of life had clashed awkwardly with the rigidities of Italian family law, creating matrimonial outlaws of innocent individuals. Many of Sansone’s real-life examples involved Italian war-brides, abandoned by foreign husbands who had since obtained divorces in their native lands but left their brides languishing, forever married in the eyes of the Italian law. Despite the parliamentary failure of Sansone’s proposals, the idea of divorce as an ameliorative measure, as opposed to one that would bring a new, American-style permissiveness into marriage, began to gain ground in Italy from the late 1950s. «Noi donne» was one of its most influential and tireless promoters, reaching a wide audience of ordinary Italian women. The ‘Italian’ notion of divorce under very limited circumstances came to be known as ‘piccolo divorzio’, the name Sansone gave it in an interview in 1954. Its cause was to be very much helped by new vagaries of life introduced by Italy’s economic transformation from the mid-1950s to the mid-1960s, and the idea of ‘piccolo divorzio’ was eventually to culminate in the successful proposal for a divorce law launched by another socialist deputy, Loris Fortuna, in 1965. During the period intervening between these parliamentary proposals, «Noi donne» assiduously investigated the relationship between economic development and family structures and consistently shared its findings, which were of great human interest, with its readers. In doing so, it disseminated to a large number of Italian women the notion that marriage and the family as institutions must be permitted to change with time. A bold step in this direction came in the guise of a series of six articles in early 1957 appearing under the collective title Che ne pensate del piccolo divorzio? (‘What do you think of little divorce?’). The timing of the series obviously relates to the brief period in the 1950s when divorce came onto the agenda in Italian politics, with the publication of Sansone’s book in 1956, and his and Nenni’s parliamentary proposals of 1955 and 1958. The first article of the series, entitled I fuorilegge del matrimonio, used the title of Sansone’s book and laid out its rationale, explaining his calculation that with about 600,000 couples separated de facto, counting the spouses, new partners, and resulting illegitimate children, more than 4 million individuals probably fell outside the strict bounds of Italy’s marriage laws. The article explained that Sansone’s proposal for a divorce law aimed to «complete» the civil code, allowing resolution of anomalous marital situations through five extremely limited provisions: cases of attempted uxoricide; abandonment or a prison sentence on the part of one partner that exceeded fifteen years; incurable mental illness; and when one partner had obtained a divorce abroad. The restrictiveness of these provisions lay behind the ‘piccolo divorzio’ epithet. The remainder of this introductory article presented five egregious cases taken from Sansone’s book, detailing for example the fate of a man married to a woman who had become a cloistered nun, or that of a woman who had been forced to marry a Polish soldier during the war, yet despite his total disappearance, remained chained to him for life and could never marry again unless she found out that the Pole had died. Subsequent articles published over the following three months thoroughly canvassed both expert and public opinion, with significant space given to readers’ letters. The majority of the prominent figures invited to comment were unsurprisingly in favour of divorce, but space was also given to the negative views of a Catholic lawyer. The sixth and final article in the series took the form of an urgent plea to parliament to take Sansone’s and Nenni’s divorce law proposal into consideration and discussion. With this impressively avant-garde series, «Noi donne» began to elaborate on the notion it had first timorously presented in 1949: that of divorce as a moralizing force, rather than the thin end of the wedge of decadent American-style individualism. The series bore all the hallmarks of «Noi donne»’s editorial style of seeking authoritative opinion, blending it with fascinating snapshots of social reality, and augmenting it with readers’ letters and views. It was the first of what was to be a long series of attempts to displace a hitherto impregnable religious position on marriage and the family and to make room for one that could be shaped by the female public’s experience of juggling work and married life. History was to show that Sansone was a man before his time, and after the failure of the 1958 proposal, divorce disappeared from the parliamentary agenda for seven years – seven years during which Italy underwent its most profound economic transformation of the twentieth century. Against the trends of the contemporary mass media, «Noi donne» kept divorce, and broader questions about the family that were so pressingly raised by the social changes wrought by Italy’s economic development, in the public eye. Il matrimonio è la tomba dell'amore? «Noi donne», 19 July 1959, p. 28. If asking what readers thought about marriage had been an eye-opening question in 1949, ten years later, to title an inquiry with the question Is marriage the tomb of love? underlined that the steel capsule of the Italian family was subject to increasing pressures. This article was the first of a series that set about investigating the exigencies of «a reality that is changing». It claimed at the outset to have revealed a new mentality starting to spread in Italy, one which struggled against «ancient prejudices». The article consisted of interviews with five couples who had been married for between two and forty-five years. It sought to portray at the grass-roots level the way the pressures of a new economy were affecting married life. The discussion focussed on changes such as the increasing costs and demands of raising children, the shift from rural to urban environments, and the gender-division of labour within the family. Familiar from today’s perspective perhaps, but challenging at the time, were questions such as how many times Eda’s husband Athos had washed the floor in eighteen years of marriage. He had done it twice, but as he joked, on those occasions, «mi sono fatto pagare, però…» (‘I made her pay me though…’). The article’s interviewees do not seem to be unhappy and there is very little to indicate that marriage might be the tomb of love. But the overall impression is a poignant sense of individuals negotiating large-scale social and economic transformation in their daily lives. Though not about divorce per se, the article falls under the broader rubric for which the divorce question was to become emblematic in the 1960s: the way economic pressures, population shifts, and changing expectations among women were affecting family life. One of the reasons why «Noi donne» is such a rich historical source is that even in the 1950s it was already asking the questions social historians only became interested in some decades later. The increasing demands and costs of bringing up children inevitably raised another question that was legally, not just culturally, a taboo in postwar Italy: birth control. The infamous article 553 of the criminal code by which the fascist regime had made the promotion of birth control a criminal offence was to remain in force in Italy until 1971. 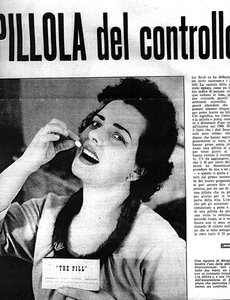 In this context «Noi donne»’s loud announcement of the arrival of ‘the pill’ in Europe in an article of March 1960 is all the more arresting, but it is further evidence of the way the magazine sought to erode «ancient prejudices» by clearing new channels for discussion among a mass audience of ordinary women. Occupying a special place in «Noi donne»’s campaign for birth control, launched in 1958 under the title Quando li vogliamo, quanti ne vogliamo (‘When we want them, the number we want’), the 1960 article reported on a visit to the UK by two American scientists who had developed the pill. It stressed that in the modern world, endowing parents with the power to decide when to have children and how many to have, rather than leaving such things to chance or «destiny», was a fundamental part of a civilized and conscientious vision of the family. The article denounced the rigidity of the Catholic Church’s view of contraception as «contro natura», and a sub-section within the article presenting the views of the euphemistically named Italian Association for Demographic Education (AIED) was titled La scienza contro i tabù (‘Science against taboos’). 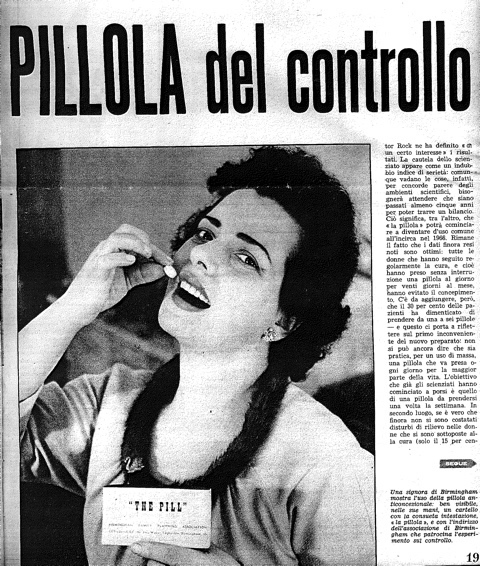 «Noi donne» effectively tossed down a gauntlet with such a phrase, and the March 1960 article on the pill indicates a shift to a more combative, urgent approach to matters concerning the family in Italy, one whose visible driving force was a concern with changing social structures, rather than ideology. «Noi donne»’s pages in 1960 bristled with the results of this commitment. In May, a prominent four-page feature entitled Urgente per la donna (‘Urgent for women’) reported an extensive survey of public opinion (male and female, «artists, professionals, workers, young, and old») carried out by «Noi donne» all over Italy. Dotted with individual comments, the most urgent matter to emerge was the conflict between full-time work and family, but other issues, such as the lack of a divorce law, also came up. The extensive array of comments from all over the nation, augmented by photographs of women in discussion groups in classrooms and piazzas, contrive to give the impression of a lively feminist ferment that well pre-dates second wave feminism. Affirming «Noi donne»’s extraordinarily avant-garde position, in July 1960 the magazine began to publish its analysis of responses to 600,000 questionnaires about women’s lives that had been distributed on the occasion of International Women’s Day on 8 March to readers all over Italy. These provided an overview of the changing reality of work life, family, marriage, and children, among women in Italy. Between these two broad-brush surveys lay a series of articles that sought to show readers just how direct was the relationship between changing social structures and matters of the human heart. The author of Non è più lo stesso cuore (‘No longer the same heart’) claimed that with the development of new attitudes among women in the workforce, «a cyclone has passed over the habits, customs and sentiments of Italians. It has entered into houses and hearts, and is changing the face of the family». As a result, even the human heart had been subject to history’s power to bring about change, and the article argued that the resulting shift away from a traditional patriarchal family structure had resulted in a «crisis» of the family. This early example of the notion that the family was entering a period of crisis presaged a view that was to become widespread later in the decade; indeed, the call for a divorce law in the mid-1960s would be presented as both a symptom of, and a cure for, this crisis. But for «Noi donne» in 1960, «crisis» could be seen positively, as an indicator of movement, a progenitor of transition, even of a ‘revolution’ in the family structure. In short, economic forces and the social contradictions they created, particularly the ‘double burden’ carried by women, had by 1960 begun to exert ineluctable force upon the steel capsule of the Italian family. It was an institution undergoing a transition that its readers were encouraged to welcome: «Noi donne» showed that day by day, the modern family was taking shape «out of the fragments of the old pyramid». In 1960 this claim was far-sighted, and ultimately, overly optimistic: not until 1975 did a thorough revision of the civil code give formal recognition to the new exigencies of late twentieth-century family life in Italy. The divorce law was ultimately a hard-won acknowledgement of the changes taking place in Italian habits, customs and sentiments that «Noi donne» both evidences and indefatigably fomented. The two parliamentary proposals for divorce initiated by Sansone had slipped unfruitfully into the past by 1960, but during this important year, «Noi donne» announced that finally a public discussion of the divorce question, which for a century had sparked «waves of fanaticism every time it was raised», had been re-opened. The occasion was the national congress of women jurists, who met in Turin that year, and devoted an entire day to the discussion of divorce. The article, entitled L’intoccabile divorzio (‘Untouchable divorce’), affirms that a taboo against mentioning divorce was very much in force in Italy, but this made the congress’s debate all the more welcome. «Noi donne» gave a reasonably measured account of the arguments for and against a divorce law, unsurprisingly opining that those in favour of divorce were obviously more aware of the «realtà attuale» (‘present reality’) of the Italian family, while those against it remained clearly attached to «alcuni schemi del passato» (‘certain ideas of the past’). Discussions of divorce in professional or official arenas such as the women jurist’s conference remained rare in the first half of the 1960s, but «Noi donne» continued to infringe the taboo with regular articles, both specifically about divorce, and about the modern family more generally. Its most striking presentation on divorce to date appeared as part of the overall ferment so evident in the pages of 1960. Under the collective title of Il divorzio: discutiamone (‘Divorce: let’s discuss it’), two lengthy articles shifted the focus from the ethical plane of the women jurists’ discussions back to the personal tragedies of marriages gone wrong. Il divorzio: discutiamone. «Noi donne», 17 July 1960, p. 18. A dramatic illustration accompanied the first article, evoking the emotional pain of marriage breakdown. The piece opened with long quotations from letters written by people trapped in marriages that had ceased to exist in reality, but were indissoluble in law. Presenting a panoply of cases that had led to suicide, violence, and murder, the article drew attention to the ugly familial underbelly of a nation so often depicted as «the cradle of love and family serenity». It presented divorce as a modern, courageous, beneficial way of addressing the dark side of this idealistic image. Two weeks later, the series’ second article took a more historical approach, exemplifying the way «Noi donne» might be seen as a university for its readers. Entitled Il grande escluso, l’amore (‘The great excluded – love’), the article was no less than a lecture on the history of marriage that could have been given by Friedrich Engels himself. It linked the institution of marriage to the historical phases of human development from earliest times through the Council of Trent to the French Revolution and the present, stressing its growing importance for property transmission, to the exclusion of love. The aim was not so much to present divorce as a way of returning to love, but to argue more broadly for a notion that family forms and the law regulating them ought not to be static, and needed to adjust as history advanced. Divorce would simply be a tool for the dissolution of loveless marriages, in an historical context where love was returning to an affirmation of its «absolute priority» as the basis of marriage. The theme of Italy’s legal backwardness in relation to the family implied by this article was underlined in a new rubric appearing at the end of 1960, entitled Tribuna per voi (‘The rostrum for you’). Appearing on an ad-hoc basis, each feature examined a particular issue of concern to everyday readers. The inaugural article was entitled La famiglia: qualcosa che scotta (‘The family: a burning issue’), with advice provided by the lawyer Maria Bassino. Before Bassino attended to readers’ letters, an editorial stressed that Tribuna per voi was like a mirror reflecting the daily drama of life tormented by the struggle between old and new, where a superannuated past still so often weighed on the present and future. Letters from readers indicated that the family was the locus where this struggle was most urgently felt. A few sentences summed up the historic mutations of daily life in Italy in these years, beginning with a new sense of women’s position in the workforce, but marked by other phenomena such as the shortening of distances, the speeding up of communication, and increasing levels of public participation in politics – the advent, in short, of «mass society», to the point where «it is blindness to affirm that in a changing society, the family must not change». «Noi donne» proclaimed that even as initiatives for such changes by far-sighted women deputies might be making slow progress, public opinion was maturing. Tribuna per voi, the editorial asserted, aimed to promote the further maturation of public opinion. To date this was «Noi donne»’s most impassioned and explicit statement of its commitment to lead what in 1960 was still a lonely crusade to explode the shibboleths that weighed on Italy’s future. With its numerous powerful articles on the future of the Italian family, 1960 was an especially important year for «Noi donne». It began a decade during which such campaigns slowly gathered momentum, as a result of which the discursive possibilities that «Noi donne» had persisted in making accessible to ordinary people began to receive much more regular attention. A signal example was Pietro Germi’s wry film, Divorzio all’italiana, a black comedy in which a bored Sicilian baron decides to do away with his wife and marry again, taking advantage of a law that punished ‘crimes of honour’ minimally. Divorzio all’italiana brought international attention to the sorts of problems that «Noi donne» had focused on since at least the early 1950s, and despite the film’s air of baroque farce, it undoubtedly contributed to the same overall cause: the recognition that Italy’s laws must change. «Noi donne» regularly reviewed films, but it gave unprecedented coverage to Divorzio all’italiana, pointing out something that is easy to forget in a post-divorce era: such a film was a courageous and risky undertaking in a society where discussion of divorce was still almost taboo. Divorzio all’italiana used comedy to approach a difficult subject, but one way it was able to keep the matter relatively light was by avoiding the subject of children: the bored baron and his wife conveniently had none. The question of the fate of children after a marital breakdown was difficult, and «Noi donne» had only referred to it in passing so far. Yet the subject is likely to have been of primary concern to a large number of readers who were either separated or having marital difficulties. In August 1961 the magazine tackled the question of children and marital breakdown specifically for the first time, asking «are the children of separated parents necessarily victims?’  The article outlines two main schools of thought. On the one hand, advocates of divorce ‘American style’ would say that the happiness of parents should come first, and that children easily adapt to new family situations. On the other, those against divorce used the problem of children as a trump card whenever arguments in favour of divorce appeared to be making ground, claiming that marriage breakups condemned children to a life of unhappiness and that the family should be kept indissoluble at all costs. There were of course no easy answers to the dilemma, but «Noi donne»’s approach was to disentangle the fate of children from the question of whether parents’ separations should receive the coup de grâce of divorce. Its position was that children are affected not so much by parental separation itself, but by the way parents behave towards each other and their children, whether together or separated. It claimed, for example, that living under the same roof with parents who stormily detest each other but who stay together «for the children» would cause those children much more anxiety than a mature, respectful separation. The article concluded that the one truly indissoluble relationship was between parent and child, and that the quality of that relationship would not be guaranteed by moral or legal pressure on parents to remain together – indeed, sometimes such pressure could do children more harm. Not wanting to sidestep the issue of children’s fates, «Noi donne» instead distinguished that question from the debate about parental separation in an attempt to forestall its use as an emotive rhetorical ploy by those who opposed divorce. With this discussion about the fate of children after marriage breakdown completing the picture, «Noi donne» had by 1961 pioneered a coherent and consistent position in relation to the main ethical issues of the divorce question. It was certainly the only mass-circulation publication for women to have established such a position, and among the few mass publications in Italy to have done so at all in an era prior to the changes in the political climate (such as the thawing of the Cold War, the Second Vatican Council, and the DC/PSI coalition from 1963) that helped clear the way for Loris Fortuna’s ultimately successful proposal of the law. Such winds of change at the level of high politics may have made way for Fortuna, but his proposal was a seed that fell on terrain that «Noi donne» had long been tilling. During the summer prior to Fortuna’s divorce law proposal of October 1965 (and certainly with foreknowledge that it was about to happen), «Noi donne» ran a series of articles that acted as a prelude to the event. In mid-July, the front cover announced a questionnaire on the modern family and its problems, complete with a special rubric on divorce. Later in July, «Noi donne»’s cover featured the word «divorce» for the first time, announcing the opening of a «grand debate all over Italy» entitled Le donne e il divorzio. The cover image is of an immaculately made-up and coiffed woman holding her index finger to her lips in a gesture that requests silence; but the ironic smile belies the gesture, as does the announcement of the opening of a great debate, which made it clear that the taboo against discussion of divorce was about to be permanently broken. Il divorzio e le donne. «Noi donne», cover, 24 July 1965. The way was paved for a much more strident and confident version of «Noi donne»’s hitherto rather discreet approach to divorce and associated issues. The grand debate was spread across three articles appearing over the summer from July to September, with extensive coverage given to ordinary Italian women, from fruit-pickers in Emilia Romagna, to civil servants and teachers in Tuscany. The culmination of this extensive coverage was «Noi donne»’s triumphant announcement, on 16 October 1965, of DIVORZIO in parlamento. The advance of Loris Fortuna’s bill through parliament marked the beginning of a drawn-out turning point in Italian history, one whose irrevocable nature was made clear by the 1974 referendum on divorce. 1965 marked the beginning of a phase whose slogan might well have been a new echo of «Noi donne»’s 1945 announcement, «ricostruiremo le nostre famiglie’, in the sense that it ultimately led to a profound reconstruction of the very concept of the family, one that finally dissolved Jemolo’s ‘steel capsule’ of 1945. «Noi donne»’s role in the divorce debates during those nine years, which it shared with numerous other publications, has been well documented elsewhere. Yet Fortuna’s proposal also marks the end of a less recognized phase, during which «Noi donne» quietly sowed the seeds of the new mentality that was to be so clearly expressed when women had their say on divorce in 1974. For nearly two decades before the launch of the media bandwagon that accompanied Fortuna’s proposal, «Noi donne» had presented large numbers of ordinary women with a way of understanding the relationship between the family and society as malleable, fluid, and historically contingent, rather than rigid and predetermined. This meant that when Fortuna’s famous parliamentary proposal began to make headway, many ordinary women, and their families too, were already familiar with the arguments that retrospectively came to signal that a new era had suddenly arrived in Italian politics. In fact the advance of the divorce debate from 1965 signalled that the parliamentary sphere’s view of the family was starting to catch up with a change in the Italian mentality that had begun, as evidenced by «Noi donne»’s coverage of family matters, many years earlier. «Noi donne»’s most significant contribution to this change fell prior to 1965, but because it was a voice in the wilderness well before its time, it has been harder to recognise, and most historical analysis has framed Fortuna’s law as the beginning of the story, rather than a turning point in the middle. Yet, as divorce was debated extensively for the first time in Italy between 1965 and 1974, «Noi donne» merely built upon the platform it had already established. It certainly continued to make a very significant contribution to its readers’ understanding of the issues involved, particularly in relation to the law’s vexed passage through parliament. Although «Noi donne» was the only mass-press women’s magazine to treat the divorce question extensively and regularly, it now did so with extensive journalistic company in the newspapers and weeklies, and its arguments, largely worked out between the early 1950s and 1961, remained unchanged. Indeed many of the article titles in the later 1960s were reminiscent of earlier ones. For example, 1967’s «Urgente per le donne italiane’ (birth control and divorce were judged the most urgently needed reforms), and 1968’s L’italiana è cambiata, l’Italia deve cambiare (‘The Italian woman has changed, Italy must change’), both neatly encapsulated «Noi donne»’s long running argument that women represented the forefront of a crusade for the reconstruction of Italian society. «Noi donne», itself at the forefront of women’s attempts to reconstruct Italy since the heyday of the Resistance, had by 1965 made a major contribution to transforming the ‘divorce question’ from a politico-religious problem into a social issue and a women’s issue. In doing so, it both prefigured and helped to lay the groundwork for the more liberationist feminist campaigns of the 1970s. For generous assistance during the research for this essay, and permission to reproduce pages of «Noi donne», I would like to thank the Unione donne in Italia (UDI Nazionale) in Rome, particularly Pina Nuzzo and Claudia Mattia. Giovanna Olivieri at the Casa Internazionale delle Donne (Rome) was also very helpful during the initial research. Patrizia Gabrielli and Riccardo Pieracci did their best to help me track down circulation figures for «Noi donne», and I am thankful for their efforts. My colleagues at the University of Otago provided useful ideas at an early ‘Work in Progress’ seminar. Robert Aldrich and Sue Burton gave me very helpful feedback on the first draft. Finally, I would like to thank Raffaella Sarti and StoricaMente’s two anonymous referees for their invaluably constructive critiques of the penultimate version. A. C. Jemolo, Urge il divorzio in Italia?, «Il Politecnico», n. 9, 24 November 1945, cited in A. Rossi Doria, Le donne sulla scena politica, in: Storia dell’Italia repubblicana, Vol. I: La costruzione della democrazia. Dalla caduta del fascismo agli anni cinquanta, Turin, Einaudi, 1994, p. 845. P. Ginsborg, A History of Contemporary Italy: Society and politics 1943-1988, London, Penguin, 1990, pp. 76-77. The position of the family in the constitution was extensively debated by the first subcommittee of the Constituent Assembly. See M. Seymour, Debating Divorce in Italy: Marriage and the Making of Modern Italians, 1860-1974, New York, Palgrave Macmillan, 2006, esp. pp. 165-168. A. Rossi Doria, Le donne sulla scena politica, cit., p. 843; and A. Agosti, Palmiro Togliatti, Turin, UTET, 1996, p. 335. A notable early exception is Alessandro Colletti’s Il divorzio in Italia. Storia di una battaglia civile e democratica, 2nd edition, Rome, Edizioni Savelli, 1974. M. Barbagli’s Provando e riprovando. Matrimonio, famiglia e divorzio in Italia e altri paesi occidentali, Bologna, Il Mulino, 1990, first questioned the commonplace that the Italian family structure had survived the 1970s intact. See, for example G. Scirè, Il divorzio in Italia. Partiti, Chiesa, società civile dalla legge al referendum (1965-1974), Milan, Bruno Mondadori, 2007, p. vii, or S. Colarizzi, Storia del novecento italiano. Cent’anni di entusiasmo, di paure, di speranza, Milan, BUR, 2005, p. 429. On the history of the divorce debates in Italy, see also D. De Vigili, La battaglia sul divorzio. Dalla Costituente al Referendum, Milan, FrancoAngeli, 2000; and M. Seymour, Debating Divorce in Italy, cit. W. Pojmann, Emancipation or Liberation? Women’s Associations and the Italian Movement, «The Historian», 67 (2005), p. 74; G. Fiume, Women’s History and Gender History: The Italian Experience, «Modern Italy», 10 (2005), pp. 207-231. Emblematic is Y. Ergas, Nelle maglie della politica. Femminismo, istituzioni e politiche sociali nell’Italia degli anni ’70, Milan, Franco Angeli, 1986; but see also the special issue of «Genesis», III/1 (2004), on the ‘Anni Settanta’. Scirè, p. 176; Seymour, p. 219. D. Forgacs and S. Gundle, Mass Culture and Italian Society from Fascism to the Cold War, Bloomington, Indiana University Press, 2007, p. 278. An earlier argument in a different context, but one that has influenced my approach, is J. Meyerowitz, Beyond the Feminine Mystique: A Reassessment of Postwar Mass Culture, 1946-1958, in: J. Meyerowitz (ed. ), Not June Cleaver: Women and Gender in Postwar America, 1945-1960, Philadelphia, Temple University Press, 1994. Selective searches through other popular mainstream women’s magazines covering the same period, such as «Grazia» and «Annabella», indicate that divorce was never a topic of extended debate, in contrast to «Noi donne». This confirms Bellassai’s claim that the discussion of anything ‘morally unorthodox’ was rare in the Italian mainstream press of the time. See S. Bellassai, La morale comunista. Pubblico e privato nella rappresentazione del PCI (1947-1956), Rome, Carocci, 2000, p. 159. For more detail on the exceptions that proved this general rule, see Seymour, ch. 7. P. Gabrielli, La pace e la mimosa. L’Unione donne italiane e la costruzione politica della memoria (1944-1955), Rome, Donzelli, 2005, p. 3. For more on UDI, see M. Richetti, M. Repetto and L. Viviani, Udi: Laboratorio di politica delle donne. Idee e materiali per una storia, Soveria Mannelli, Rubbettino Editore, 1998; M. Casalini, Le donne della sinistra (1944-1948), Rome, Carocci, 2005; and W. Pojmann, “Join us in Rebuilding Italy”: Women’s Associations, 1946-1963, «Journal of Women’s History», Vol. 2, 4 (2008), pp. 82-104. On «Noi donne» more specifically, see R. Pieracci, Progetti, immagini, modelli. La stampa dell’UDI e del CIF tra affinità e differenze, in: P. Gabrielli (ed. ), Vivere da protagoniste. Donne tra politica, cultura e controllo sociale, Rome, Carocci, 2001, pp. 131-157; and Casalini, passim. «Noi donne», 15 May 1945, front cover. All translations from the Italian are the author’s. For example, A. Rossi Doria, Le donne sulla scena politica, cit., pp. 842-843. S. Bellassai, La morale comunista, cit. In relation to marriage and divorce see in particular chapter 2, pp. 153-161. For example, P. Ginsborg, A History of Contemporary Italy, cit., p. 85. Subsequent work has considerably nuanced our view of the relationship between UDI and the PCI – see in particular Casalini, pp. 15-16. See, for example, N. Rothenberg, The Catholic and the Communist Women’s Press in Post-War Italy – an Analysis of «Cronache» and «Noi donne», «Modern Italy», Vol. 11, 3 (2006), pp. 285-304. The fact that ultimately the parliamentary champion of divorce was the PSI and the most visible extra-parliamentary exponent was the Radical Party probably caused some disappointment to UDI and the editors of «Noi donne». Nevertheless, «Noi donne» willingly drew its readers’ attention to these parties’ contributions to women’s issues. See, for example, I partiti politici e le donne: il Partito Radicale, «Noi donne», 11 June 1961, pp. 32-33. S. Cassamagnaghi, Immagini dall’America. Mass media e modelli femminili nell’Italia del secondo dopoguerra, Milan, Franco Angeli, 2007, p. 47. R. Pieracci, Progetti, immagini, modelli, cit., p. 137. It has not been possible to ascertain precise circulation figures for «Noi donne» in the 1960s, but reference to the distribution of 600,000 questionnaires on the occasion of March 8 1960 could be taken as an indication that circulation remained fairly steady at about this figure (see note 42). Pieracci, Progetti, immagini, modelli, cit., pp. 138-139. La fatica di divenire Miss Italia, «Noi donne», 10 January 1954, pp. 6-7. «Noi donne», 31 January 1954. Forgacs and Gundle, Mass Culture and Italian Society from Fascism to the Cold War, p. 97 and p. 108. (“Noi donne” era la nostra università, era la mamma che ci prendeva per mano per insegnarci le cose), M. Casalini, Le donne della sinistra, p. 171. Che cosa pensate del divorzio?, «Noi donne», 16 January 1949, p. 5, cited in Bellassai, La morale comunista, cit., p. 158. M. Barlocco, Nel paese del divorzio, «Noi donne», 5 June 1949, p. 13, cited in Bellassai, La morale comunista, cit., p. 158. Bellassai, La morale comunista, cit., p. 159. L. Sansone, I fuorilegge del matrimonio, Milan-Rome, Edizioni Avanti!, 1956. L. Sansone, Ecco il mio progetto del “piccolo divorzio”, «L’Europeo», 24 October 1954, p. 15. G. Panzieri, Che ne pensate del piccolo divorzio? 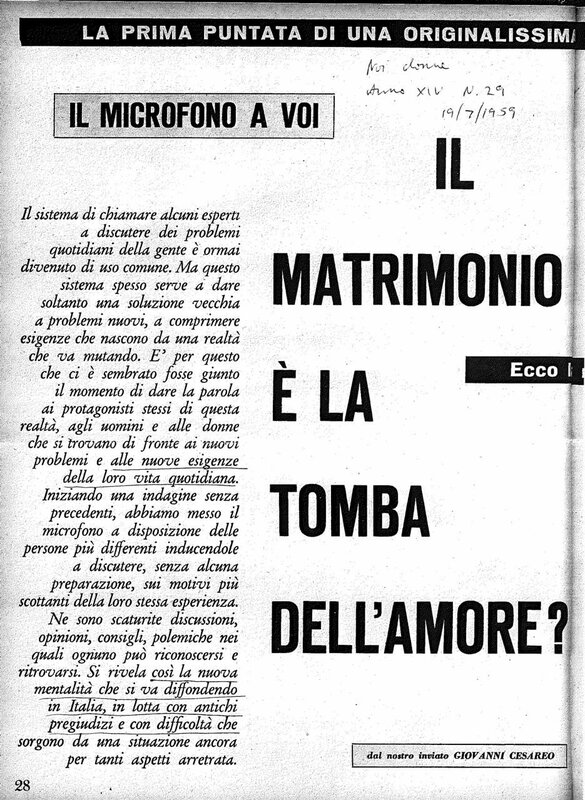 I fuorilegge del matrimonio (I), «Noi donne», 13 January 1957, pp. 6-7. G. Panzieri, Che ne pensate del piccolo divorzio? (II), «Noi donne», 27 January 1957, pp. 16-17, cont’d p. 37; Che ne pensate del piccolo divorzio? Matrimoni perduti (III), «Noi donne», 3 February 1957, pp. 30-31; Che ne pensate del piccolo divorzio? Il dito sulla piaga (IV), «Noi donne» 10 February 1957, p. 23; Che ne pensate del piccolo divorzio? Un centro di studi per le delusioni matrimoniali (V), «Noi donne», 24 February 1957, pp. 30-31. The personalities featured were Sansone, Paola Masino (writer for the communist review Vie nuove), Catholic lawyer Osvaldo Bruni, lawyer Gabriella Nicolaj, and leftist writer Vasco Pratolini. Che ne pensate del piccolo divorzio? La salvezza del matrimonio è anche nel “piccolo divorzio” (VI), «Noi donne», 3 March 1957, p. 13. (Una realtà che va mutando). G. Cesareo, Il matrimonio è la tomba dell’amore?, «Noi donne», 19 July 1959, pp. 28-32. It is worth noting however that «Noi donne» placed its main emphasis on the practical, empirical aspects of social change. As Penelope Morris has pointed out, emotions and female subjectivity often only appeared in ‘agony columns’. See P. Morris, From Private to Public: Alba de Céspedes’ Agony Column in 1950s Italy, «Modern Italy», Vol. 9, 1 (2004), p. 11; and P. Morris, The Harem Exposed: Gabriella Parca’s "Le italiane si confessano", in P. Morris (ed. ), Women in Italy, 1945-1960: An Interdisciplinary Study, New York, Palgrave Macmillan, 2006. G. Cesareo, È arrivata in Europa la pillola, «Noi donne», 20 March 1960, pp. 18-21. Marxism of course provided UDI’s and thus «Noi donne»’s theoretical framework. A reminder of this is a paper produced by the women’s section of the PCI in early 1960 outlining their position on problems relating to the family. It quotes Lenin and refers to the position of the family in the USSR extensively, as well as making a declaration in favour of Sansone’s and Nenni’s proposal for a divorce law in Italy (Direzione, Partito comunista italiano, Sezione femminile, La nostra posizione su alcuni problemi inerenti la famiglia [sic], 18 January 1960, typescript, Archivio UDI, Sede Nazionale, Rome, FA/DI 60.1/1). In the pages of «Noi donne», however, Marxist ideology was more implicit than explicit. Urgente per la donna, «Noi donne», 15 May 1960, pp. 12-15. Dal lavoro nasce il futuro, «Noi donne», 3 July 1960, p. 17. It is worth noting that even though concerns about women’s roles in the workforce dominate the pages of «Noi donne» in the early 1960s, census data indicate the percentage of women in the Italian workforce actually reached its lowest point in 1961. See, for example, R. Sarti, Work and Toil: The Breadwinner Ideology and Women’s Work in 19th and 20th C Italy (accessible at www.uniurb.it/scipol/drs_work_and_toil .pdf ), pp. 23-25. («Con il lavoro della donna, un ciclone è passato sulle abitudini, sulle consuetudini, sugli affetti degli italiane. È entrato nelle case e nei cuori, sta mutando il volto della famiglia». L. Melograni, Non è più lo stesso cuore, «Noi donne», 12 June 1960, p. 29. («rinasce dai frammenti della vecchia piramide»). Ibid, p. 31. («ondate di fanatismo ogni volta che è stata sollevata»). G. Cesareo, L’intoccabile divorzio, «Noi donne», 12 June 1960, pp. 14-16. («la culla dello [sic] amore e della serenità familiare»). G. Cesareo, Il divorzio: discutiamone, «Noi donne», 17 July 1960, pp. 18-21. G. Cesareo, Il grande escluso, l’amore, «Noi donne», 31 July 1960, pp. 29-31. («È da ciechi affermare che, in un mondo che muta, la famiglia non deve mutare»). Tribuna per voi. 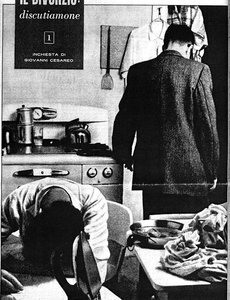 La famiglia: qualcosa che scotta, «Noi donne», 4 December 1960, pp. 16-19. The six readers’ letters published cover dowry problems, the husband’s authority over both wife and children, marital separation and illegitimate children, and indissolubility of marriage – all matters that had been the subject of recent parliamentary proposals, most of them by women deputies. M. Maffei, Il “divorzio” di Daniela, «Noi donne», 23 July 1961, pp. 38-41. («Sono necessariamente delle vittime, i figli dei genitori separati?»). G. Ascoli, I figli della separazione, «Noi donne», 6 August 1961, pp. 18. 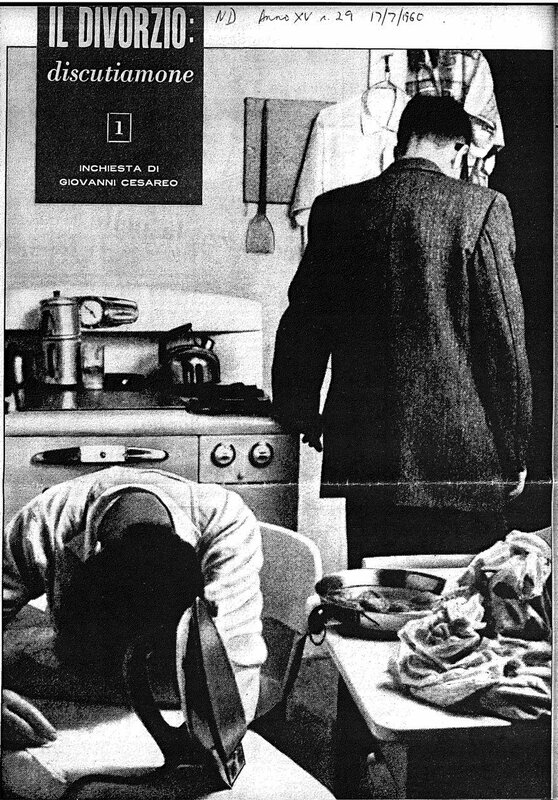 La famiglia moderna e i suoi problemi, «Noi donne», 17 July 1965, front cover, and pp. 14-15. «Noi donne», 24 July 1965, front cover. M. Pastorino, Il divorzio e le donne: a confronto legge e realtà, «Noi donne», 24 July 1965, pp. 18-21; M. Pastorino, Il divorzio e le donne: se papà e mamma si dividono, «Noi donne», 28 August 1965, pp. 28-31; L. Melograni, Il divorzio e le donne: L’indissolubilità nasce dal cuore, «Noi donne», 25 September 1965, pp. 38-40. M. Pastorino, DIVORZIO in parlamento, «Noi donne», 16 October 1965, pp. 10-11. A sense of the media’s involvement is well portrayed by De Vigili and Scirè. Urgente per le donne italiane, «Noi donne», 21 January 1967, pp. 8-13. 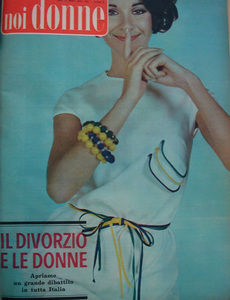 L’italiana è cambiata, l’Italia deve cambiare, «Noi donne», p. I of a special Women’s Day supplement to the issue of 9 March 1968.